Now open in Suite 232, We are showing works from previous exhibitions. John Windle Antiquarian Bookseller & The William Blake Gallery are delighted to announce to our special customers interested in Blake that we have recently acquired two more fascinating collections of material about William Blake and his circle. Due to this embarrassment of riches we are holding a once-only sale of Blake material that we currently hold in multiple copies. This includes illustrated books, press books, and standard reference books. Print copies are also available. This offer is good until October 14th 2018. All orders over $500 shipped post free. Of especial interest to many customers will be the fact that we now have all the Trianon Press Blake Trust facsimiles in multiple copies, both de luxe issues and regular issues. This offers an uncommon chance to complete or upgrade your collection. In addition, Trianon Press proof prints remaining from our Blake in Color exhibition are also included in the terms of the sale. Please inquire for prints. A Tribute to Gerald E. Bentley, Jr. 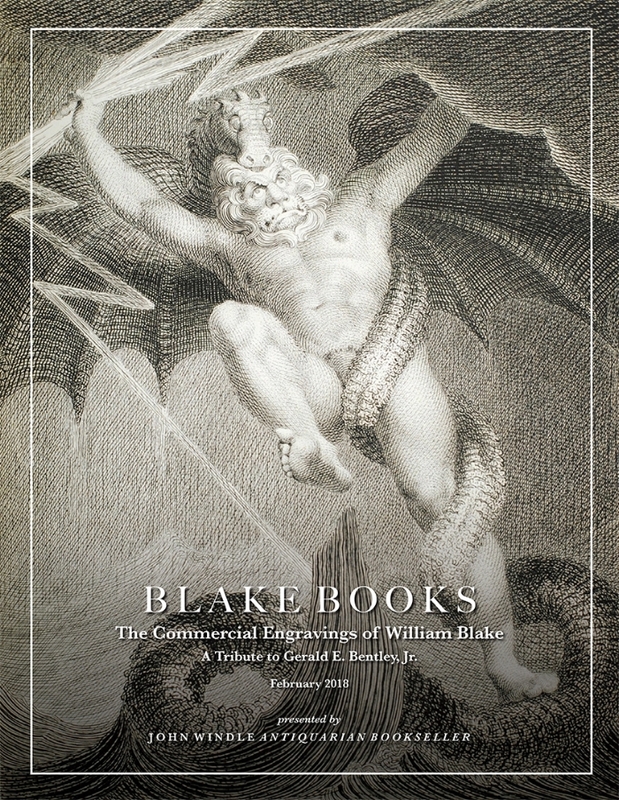 Please join us for our new exhibition BLAKE BOOKS: The Commercial Engravings of William Blake, A Tribute to Gerald E. Bentley, Jr.
Blake is best known today for his independent vision and experimental methods, yet he made his living as a commercial illustrator. This exhibition shines a light on those commissioned illustrations and the surprising range of books in which they appeared. In them we see his extraordinary versatility as an artist but also flashes of his visionary self—flashes not always appreciated by his publishers. On display are the books themselves, objects that are far less familiar to his admirers today, but that have much to say about Blake the artist. The exhibition is a small tribute to Gerald E. Bentley, Jr. (1930 – 2017), whose scholarship, including the monumental bibliography, Blake Books, contributed immeasurably to the understanding and appreciation of the enormous range of Blake’s works. Poetical Sketches. By W.B. London: 1783. The Pastorals of Virgil... London: 1821. Remember Me! A New Years Gift or Christmas Present, 1825. London: I. Poole, . The Botanic Garden. London: Johnson, 1795. Examining Blake’s affinity with the immaterial world. Please join us for our new exhibition William Blake: Dreams & Visions, a selection of some of his most personal and adventurous works. This collection showcases Blake’s fascination with a world unique to his own perception in which the boundaries between imagination and vision dissolve away. It includes one of Blake’s “Visionary Heads,” from a series of sketched portraits of historical figures who visited Blake in spirit form as he sat by his London fireside, along with other works created from a place somewhere between dream and vision. “Holy Thursday”, proof plate from the Songs of Innocence (1789). “Visionary Head: Jonathan”, pencil sketch (c. 1819-1825). Frontispiece, “Lenore, clasping her spectral bridegroom,” to Leonora. A Tale, Translated and altered from the German of Gottfried Augustus Burger (1796). Please join us for a screening of the new multi-media work Divine Madness: The Visions Albion, a tribute to William Blake, first performed at King’s Place in the heart of Blake’s London in November 2016. Scored for Tenor solo (Charles Daniels), actor (Oliver Ford Davies) and six viols (Fretwork) with a background visual score by Robert Golden, the work tackles the complexities of Jerusalem using texts from Milton to make sense of Blake’s final and intriguing poem. It culminates in a new setting of “And did those Feet in Ancient Time”. This unique event was critically acclaimed in the UK and will be presented in its entirety for one night only at the Book Club of California through professional video recordings. In Divine Madness, Graham Treacher, a Blake devotee since childhood, explores his profound relationship to Blake’s poetry and visual art through his striking musical compositions, as well as those of John Milton Sr, and influential Tudor era composer Orlando Gibbons. These movements alternate with excerpts from Blake’s penultimate poem Milton, as well as his masterpiece Jerusalem, and serve to elucidate Blake’s obscure mythology. Anyone who has pondered the mysteries of Blake’s great Giant Albion, his visions and his prophecy of the ‘Great Harvest’, will enjoy seeing his story unfold. Refreshments from 5:00 to 6:00 pm. Performance from 6:00 to 7:00pm. As space is limited, please RSVP to us at john@johnwindle.com, (415) 986-5826. William Blake in Color: For the first time a massive volume of 2500+ rare plates from the Trianon Press Illuminated Book series enters the collector market. Additional proofs and personal archives from legendary Trianon producer, Arnold Fawcus are also made publicly available. San Francisco, Calif. — The William Blake Gallery presents William Blake In Color,a selection of plates from the Illuminated Books of William Blake (1951 – 1987) by the Trianon Press for the William Blake Trust. The exhibition reinvigorates the current William Blake market, entering over 2500 plates into the forum, as well as never-before-seen personal archives by Arnold Fawcus, the renowned founder of Trianon Press. Each plate is priced between $50 and $500, and in doing so, The William Blake Gallery seeks to accommodate the widespread and multi-generational interest in Blake—countering the belief that Blake’s work is predominantly reserved for museums, institutions or established collectors. Approximately 50 plates will be on view with access to an additional 2000 in the gallery’s extensive library. In 1949 the William Blake Trust commissioned the Trianon Press to create facsimiles of the Illuminated Books of William Blake as a means to create deeper public awareness of the artist. Under the direction of Arnold Fawcus, the founder of Trianon Press, the craftsmanship of the books drew critical acclaim. Fawcus assembled a crew of elderly skilled craftsmen in Paris to perform laborious antiquated printing processes involving collotype and pochoir—a stencil-based technique used to hand-color prints, characterized by crisp lines and brilliant colors; the resulting images have a freshly printed or wet appearance. The near indistinguishable facsimiles mirror Blake’s original printing processes between 1789 and 1826. By the late 1980’s the Trianon Press facsimiles had themselves become rare books. In 2016 San Francisco-based antiquarian bookseller John Windle seized the rare opportunity of acquiring every single Blake Trust Trianon Press book as well as a collection of personal notes and proofs by Fawcus created during the monumental printing initiative. As the holder of the largest collection of available Blake work in North America, Windle creates a new opportunity in the Blake market by introducing the massive influx of prints to the public. 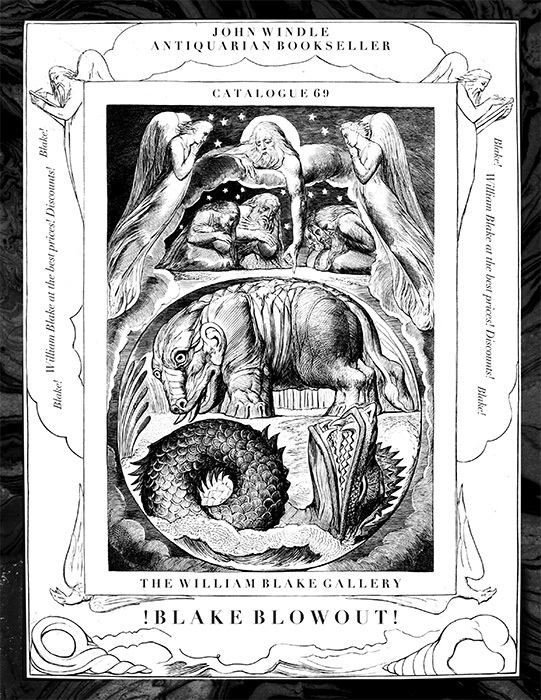 The William Blake Gallery celebrates this release with William Blake in Color,and continues the Blake Trust’s mission of broadening awareness among new generations of Blake enthusiasts. The William Blake Gallery, a new exhibition space in San Francisco dedicated to works created by the massively influential 19th century poet, artist, and engraver. The gallery is the largest of its kind devoted solely to the artist, as well as the largest collection in the world of pieces by Blake available for purchase. After 50 years in the book trade and 43 years operating John Windle Antiquarian Bookseller, longtime rare book dealer, John Windle, opened William Blake Gallery in October, 2016, within San Francisco’s historic 49 Geary building. The first physical space exclusively dedicated to Blake’s work in over two hundred years, The William Blake Gallery houses hundreds of original Blake pieces alongside thousands of reproductions of the artist’s own writings and artwork. John Windle Antiquarian Bookseller offers an exceptional selection of rare books and manuscripts from medieval times through the twentieth century. Located in downtown San Francisco, the shop specializes in medieval illuminated and text manuscripts, illustrated books and fine bindings from the 15th through the 20th century, and children’s books from 1750 to 1950. They have served an international clientele of private collectors, libraries, and institutions for over 40 years. Widely considered to be one of the greatest contributors to the Western world of literature and art, William Blake’s lifetime of otherworldly work was motivated by mystic visions and spiritual revelations. Creating hundreds of artworks — from engraved illustrations and illuminated books to original writings and watercolors — his deeply unique style remains endlessly enigmatic and highly sought after. Favored by an eclectic groups of fans and collectors, Blake remains one of the only seminal Romantic artists whose work is still occasionally available to collect. Join us for an evening of champagne, art history and a viewing of the new exhibition Blake in Color. Beginning at 5pm John Windle will discuss the renowned printing initiative by the Trianon Press, commissioned by the William Blake Trust. The legendary reproductions of the Illuminated Books of William Blake won critical acclaim for their exquisite craftsmanship and are now highly sought after books in their own rights. Having personally known Arnold Fawcus of the Trianon Press, John will speak to Fawcus’s arduous task of mirroring Blake’s original printing processes between 1789 and 1826 and the remarkable faithfulness of the resulting facsimiles. In celebration of the new exhibition we are delighted to invite you to a performance of Voice from the Fire by Betsy Davids and James Petrillo. The storytelling performance evokes the life, love, work and visions of William Blake and his wife Catherine Blake. The story is told by Davids and Petrillo in a simply-staged one-hour performance accompanied by projections of Blake’s work. Voice from the Fire was first performed in Philadelphia in 1983 and has had repeat performances ever since in response to the continued enthusiasm and interest in William Blake. Drinks and snacks from 5:00 to 6:00 pm. Performance from 6:00 to 7:00pm. $10 at the door. we recommend calling in advance to avoid finding the gallery closed by chance.